George Graham reviews Karl Denson's "Gnomes and Badgers"
The commercial pop scene has taken the soulful funk that originated in the 1960s and 1970s, and mutated it into soul-less computer driven electronic material that so dominates the media. But there seems to be a revival of more classic-style funk, with numerous recent bands borrowing from various aspects of the scene of nearly 50 years ago, evoking Memphis-style funk, James Brown influence, artists like Prince and others,. This week we have a new recording that is an eclectic revival of different facets of funk. 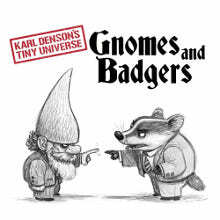 It’s by Karl Denson’s Tiny Universe, and the album is called Gnomes and Badgers. Karl Denson is a California-based saxophonist and vocalist with a jazz background, who has worked as a session musician and touring band member for the Rolling Stones – appearing on the Stones’ 2005 live album, and played in Lenny Kravitz’ band. Denson also formed the Greyboy Allstars, a funk and jazz group from San Diego. Karl Denson’s Tiny Universe released their first album in 2002, which showed more of Denson’s jazz side. The new record Gnomes and Badgers, which features almost entirely different personnel than their last album in 2009, is more funk-oriented and and like some of the music from back in the day, features some lyrics that can address the state of the world, often obliquely, but sometimes with a degree of directness. Denson’s band, abbreviated as KDTU, is a seven piece group with two horns, two guitars, keyboards, bass, a drummer and a percussionist. The new album also has numerous guest musicians on backing vocals, and notable instrumentalists including Aaron Neville of the Neville Brothers, and Chuck Leavell who also tours with the Rolling Stones, and was part of the Allman Brothers Band, New Orleans musical fixture Anders Osborne, and Willie Nelson’s son Lukas Nelson on guitars. The result is a big group with the electric energy of rock and the horn arrangements of funk. Denson is lead singer on most tracks and his vocals, shall we say, “get the job done.” It’s in keeping with the generally gritty sound of the band on this album. Gnomes and Badgers the new recording by saxophonist and vocalist Karl Denson and his group Tiny Universe brings together a creative mixture of funk, rock and a little jazz. The seven piece band, along with the guest musicians, generally play at a high energy level, and keep an electric sound. The material is well-crafted and intelligent, musically and lyrically. The band is tight and pulls off the arrangements with aplomb. The one area where the album falls down is in sound quality. We’ll be generous to give it a grade C. Almost all the instruments sound over-driven and somewhat distorted. The clarity of the sound is awful. Sometimes the guitar effects can sound ugly. The recording was badly over-compressed so everything is the same loud volume, which causes you to turn the volume down when listening, and then it sounds small, flat and not at all punchy as a good funk record should be. Karl Denson has had an interesting career with his involvement with jazz, his work as a backing musician to the stars, and as a sax-playing singer-songwriter. The new album by Karl Denson’s Tiny Universe is one of his best projects musically, and shows that classic, non-electronic funk is alive and well, with perhaps a new twist or two. (c) Copyright 2019 George D. Graham. All rights reserved.